Check which test strips are compatible with which blood glucose meters and vice versa with the MIMS blood glucose meters/test strips table. 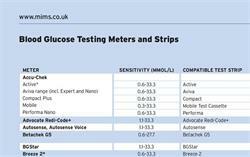 This table lists meters for measuring blood glucose, including Accu-Chek, Contour, FreeStyle, GlucoMen, GlucoRx and OneTouch, along with compatible test strips available on NHS prescription. Meter/strip sensitivity ranges (mmol/l) and manufacturer details are provided. Test strip names link through to the full MIMS entries for more detailed prescribing information on each product.